Awhile ago I saw that CC of Pink Candles at Ridgemont High went to URBN in North Park and had some Mashed Potato Pizza. 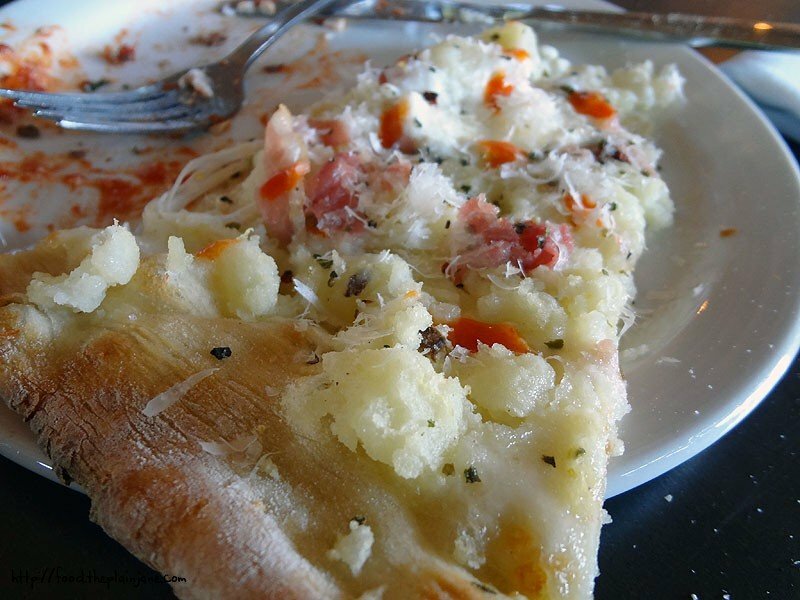 I remember being terribly intrigued by it – pizza… with mashed potatoes on it? Sounds totally crazy and weird, but I just had to try it. Fast forward to a few months later and Jake and I finally made our way around to URBN. URBN is a much larger space than I first thought. We sat in one of the booths on a Saturday afternoon. Both of the garage doors were open creating a nice cross breeze. It almost felt like we were sitting outdoors. 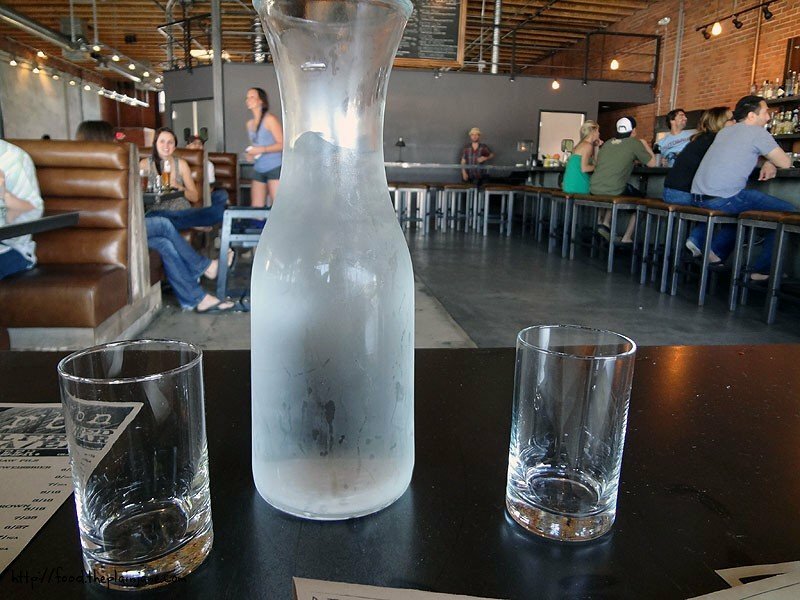 I kinda dug that our waitress brought us our own little carafe of water and little glasses. I like things like that. 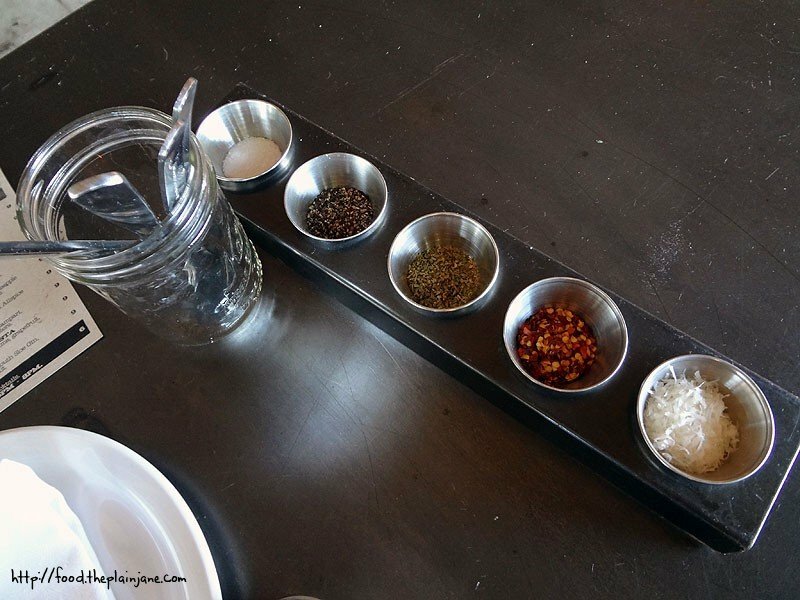 After we placed our order, we also got this little condiment tray of extra spices. From left to right, salt, pepper, oregano, red pepper flakes and shredded Parmesan cheese. Jake and I shared this order of Housemade Meatballs. I usually like to get meatballs on my pizza, so I felt I had to make up for it another way by getting meatballs on the side. It comes served in a little cast iron pan with marinara sauce, a big dollop of sweet ricotta, Parmesan on top and a baguette on the side. 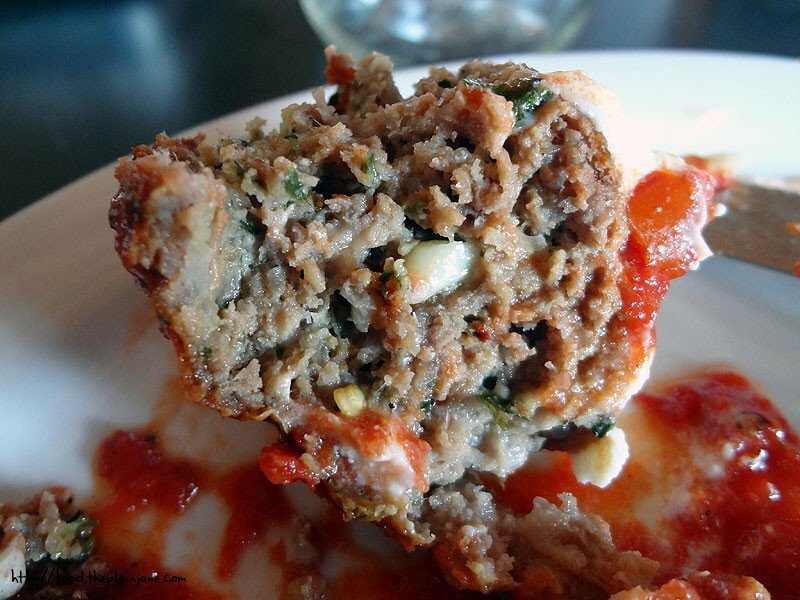 The meatballs are filled with goodies – lots of herbs and garlic. They were so flavorful, juicy and rich. The herbs and garlic were nicely infused in the meat and the dollop of ricotta was a perfect accompaniment to the meat. It provided a nice sweetness to go along with the sauce and meatball. Jake and I used the bread to make mini open faced meatball bites and to sop up any remaining sauce. Totally delicious. 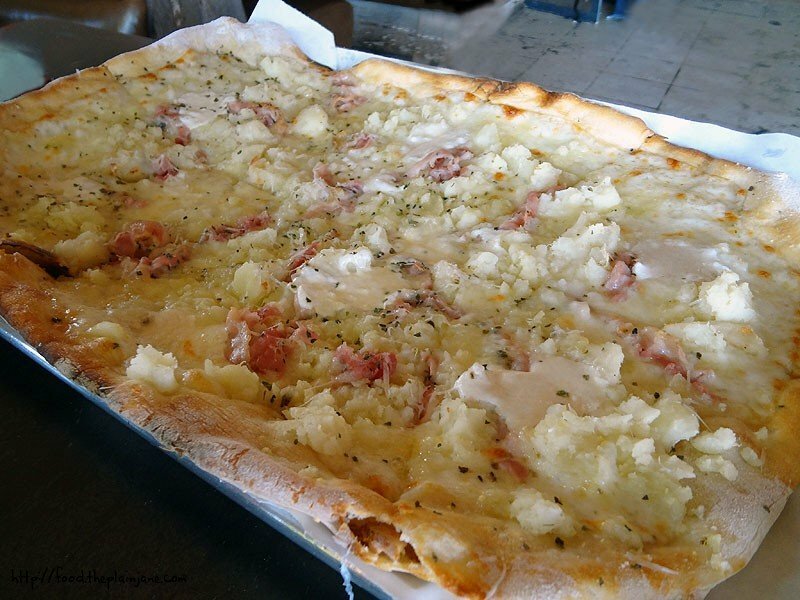 This is a White Pie (Parmesan, garlic, olive oil) with mozzarella, pancetta and mashed potatoes. This was way bigger than we thought it would be, so we were glad that we A) for the small and B) did not order a second pizza. It’s a thin crust and made kind of square. The big dollops of white are melted mozzarella. On my own slices, I added pretty much all of the “extras” – more oregano, cheese, red pepper flakes, salt and pepper. The mashed potatoes are kind of bland and the extra seasonings help give a little extra kick of flavor. Our waitress wisely suggested that we add a dash of Choula sauce for an extra bit of spice and it turned out to be just what it needed. The crust is nice and crisp – perfectly done in my book. Overall I liked it, but I felt I had to add a bunch of stuff to it to give it more flavor. Still good, though I would probably like way more garlic. Then again, I lubs the garlic. I could not be a vampire. This pizza did inspire me to try and recreate this at home though – I’ll be posting about that later this week! 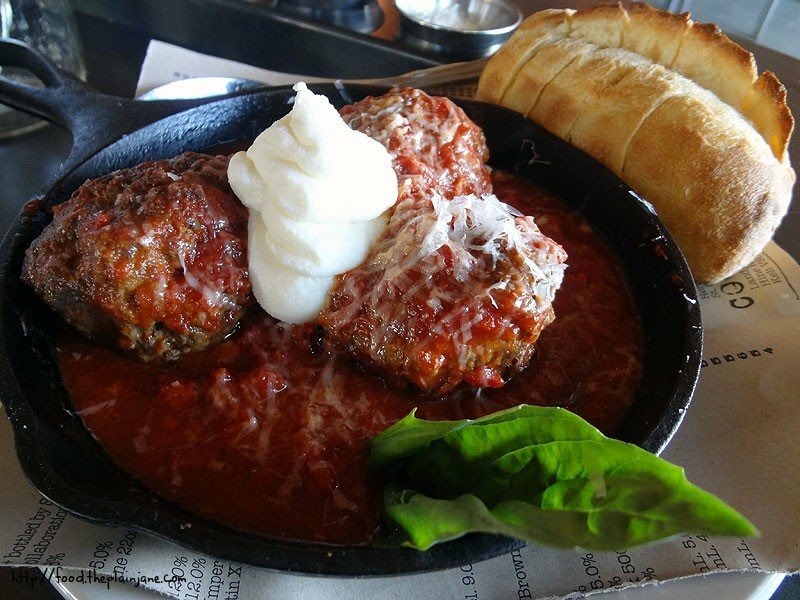 Meatballs in cast iron skillet would hit the spot right now, not sure about the smashed potato pizza, but worth a try. Darn. I need to go soon. Between the meatballs and the mashed potato pizza, you have me sold. ooh, looks like they changed the shape of the pizza. it was round when i went about a year ago. we liked their meatballs too! glad you guys liked going here. i went because i read an article that it was one of the few (if only) place that serves new haven style pizza. Hi Dad – The meatballs are really good. They have other normal pizza too! Hi Darlene – The mashed potato pizza is definitely different! Leanne said that their dessert is excellent, too (ice cream sandwich with freshly baked cookies, mmm). Hi CC – Oh, that’s interesting to note that it used to be round. We thought it huge for a “small” size! It was served on a cookie sheet, too. Glad I read about the pizza on your blog!